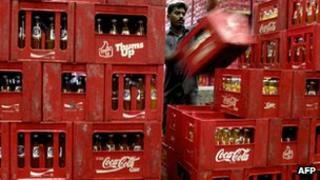 Coca-Cola has reported higher quarterly sales thanks to strong growth in emerging markets. The US soft drinks giant announced a 6% rise in operating revenue to $11.14bn (£6.98bn) in the first three months of the year on the same period a year ago. It said it had seen volume growth in all regions that it operates in but highlighted India (+20%), China (+9%) and Brazil (+4%). Net profit for the quarter rose 8% on the year to $2.05bn. As well as Coke, the group owns other brands including Fanta, Sprite, Vitaminwater, Powerade, Minute Maid and Del Valle. Volumes grew 9% at its still beverage division, outperforming the 4% growth in sparkling beverages.